Try a smart option Sesame-Ginger Coleslaw! 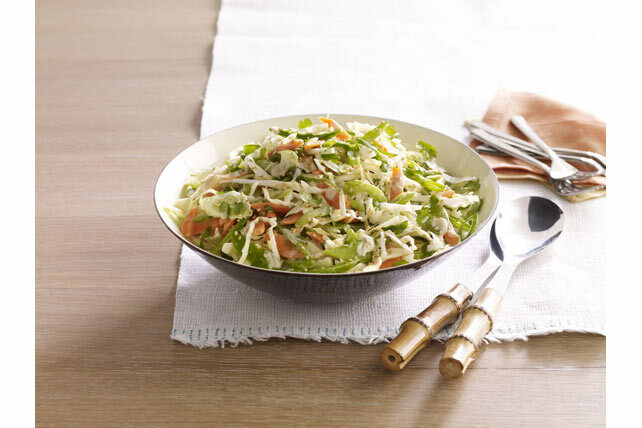 Lime juice adds brightness to this yummy Sesame-Ginger Coleslaw featuring sesame dressed and minced ginger. Combine all remaining ingredients except sesame seed in large bowl. Add dressing mixture; toss to coat. For convenience, the dressing mixture and vegetables can be prepared ahead of time. Store (separately) in refrigerator up to 24 hours before using as directed.